Will scandal over a shady land deal between a college district and developers be buried under the rug after the DA exonerates everyone? Scandal involves duplux at 1025-27 15th Street. Click on the image to see the large Google map and street view. Dumanis’ deputy Mike Still had investigated the 2006 land transaction between the District and local developers who – as we finally discover in the fourth paragraph – were bigtime guys Mike Madigan and Paul Nieto – and concluded that there had been “misleading statements” made, and “some misrepresentations on the front end, but they may have been misunderstandings as well.” The article mentioned that “a one-year statute of limitations had expired on any possible misdemeanor charges,” and that DDA Still had said that felony charges also were considered but dismissed as too harsh. Madigan and Nieto had pocketed a tidy sum of over half a million dollars after buying up a parcel downtown and turning around and selling it to the District. The San Diego Community College District. Madigan and Nieto had bought the parcel on 15th Street – a duplex – for $750,000, and then nine months later, sold the same parcel to the District for $1.28 million, making them $534,375. The District wanted the land for part of its downtown campus expansion, part of a $1.5 billion bond-funded renovation and expansion project. So, the District bought it. Trouble was, Madigan and Nieto knew the District wanted the property when the developers bought it. And when they sold it to the college, they used a private trust in Nieto’s father-in-law’s name. Typical land deal in San Diego? Rich developers having the pull, connections, and economic muscle to make profits from land transactions involving government entities – in this case, a community college district- ? Happens all the time, you might say. But, wait a minute. Why the big hubbub? Why the investigation in the first place? I began to wonder if reporter Vigil had read all the previous U-T articles about the very same land deal, articles by other reporters, but articles that raised the outcry about the deal in the first place. I ask this because her article barely scratched the surface about this nefarious affair, obviously downplaying a scandal that her own paper had been up in arms about just a year and a half ago. In fact, U-T reporters Tanya Mannes and Agustin Armendariz wrote a two-part series about the land deal, and the paper ran two editorials decrying the “shady”real estate transaction. One editorial called for an investigation of Madigan and Nieto’s deal with the College District by the DA’s Public Integrity Unit. Not to mention all the other weird stuff. Like, when the Union-Tribune staff began snooping around the College District administrator who had facilitated the sale, asking questions, the administrator abruptly quit. This was after 27 years with the District. 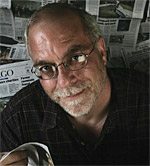 Then, after the scandal had broke, and the day after the popular, U-T columnist – no longer with the paper, Gerry Braun, publicly called for Paul Nieto to resign from his seat on the San Diego Regional Airport Authority, he did just that – he resigned – and then he left town the very next day. He also resigned from the San Diego Regional Economic Development Corp’s board. Braun had also called for Madigan to “retire from public life” and that it was “up to the rest of us to keep him (retired). With an “ankle bracelet if necessary.” Madigan seems to have dropped out of sight since then. So why is it, now, that DA Bonnie Dumanis has dutifully declared that nothing was illegal, the entire thing is unceremoniously dropped by the very newspaper that brought it to the public’s attention? (The excellent original series on the land deal was a rare muckraking investigation by the U-T on the shenanigans of local developers.) Many of the staff have departed or been bought out, the paper is up for sale, or perhaps there’s simply no enthusiasm to keep scandals alive. At any rate, we believe that there are enough unanswered questions to pick the issue out of the dustbin of history that the Union-Tribune and the District Attorney tried to throw in, shake it off, and give it another chance to see daylight. For the sake of all around, why don’t we do our own recap right here, using of all things, the prior Union-Tribune articles. First of all, who are these guys? Mike Madigan and Paul Nieto? Mike has been a fixture in downtown San Diego for decades. Called the “ballpark czar”, he had been hired as a consultant to coordinate San Diego’s $1 billion ballpark development when Petco was being built. You couldn’t attend a City Council hearing back in the 1990s and early years of this century without seeing Madigan in front of the Council. He had tremendous connections to local government. Madigan’s largess, however, has been sullied over the last few years. He and his wife, Laurie Madigan, had been in at least two other scandals of recent years. In 2003, Madigan was fined $1,000 by the San Diego Ethics Commission for 6 violations because he had failed to report his or his wife’s financial interests as a city consultant. For example, he failed to report Laurie’s stake in her own consulting company, a company that represented the Padres and the Centre City Development Corp on the Petco ballpark and redevelopment project. So, while he was coordinating the City’s end of the project, his wife’s company was representing the Padres and CCDC. Sweet. And he conveniently didn’t disclose this. The first strike occurred in 2002, when Madigan held the wondrous title of “ballpark czar” and drew an equally wondrous city salary of $200,000 – $267,851 with benefits – which was more than the city manager or city attorney earned. Madigan was hired to facilitate the $1 billion ballpark and redevelopment project downtown, the richest real estate transformation in city history. He never finished the job. Czars don’t give up their power easily, but Madigan had to step down when he and his wife bought a condo located not in the 99.9 percent of the county outside his influence, but smack dab in the middle of the booming ballpark district. To avoid a conflict of interest, the city transferred Madigan to a less-important assignment. The good news for him (bad for you taxpayers): He kept that impressive salary. Then there was the Union-Tribune’s October 2006 report about Laurie bringing in TMG – Nieto’s company that Mike worked for – to redevelop an old Chula Vista theatre while she happened to be the city’s community development director. Another sweet. Her involvement, it was found by prosecutors, had “tainted the process” and the deal was canceled. Of course, there’s also this more recent thing: Laurie was forced to resign under pressure from Chula Vista in March 2007, because, again, she had pushed a company that Mike worked for into negotiations with that city over a large bayfront development project. But Chula Vista officials were apologetic. Laurie walked away with a $155,000 severance package and lifetime retirement benefits, plus she had her legal bills paid. Triple sweet. Paul Nieto, former president of East Lake Co., a Chula Vista home builder in the 1990s, who made a lot of money, was – at the time – on the San Diego County Regional Airport Authority board, and at least one other local board. He also headed up TMG, a San Francisco company, which Madigan worked for. August 2004 – Mike Madigan and Paul Nieto, fronting for Nieto’s company, TMG, begin exclusive negotiations with the Community College District to develop two blocks in East Village, between 12th, 14th Streets, and E and F Streets, most of which the District owned. These negotiations carry over for a year, till August 2005. No agreement between TMG and the District is ever finalized or consummated. During this period, Madigan and Nieto have ample opportunity to learn that the College District is interested in another parcel for its expansion, this one on 15th Street. October 2004 – the owners of the duplex at 1025-1027 15th Street decide that the San Diego housing market is hot, so they place their property up for sale for $795,000. The owners are actually two couples, the Creeks and the Sumidas. Milton Creek and Esao Sumida are architects, and have been good friends since college. The couples have held on to the property for more than a quarter century as a nest egg for their retirement. On behalf of TMG Partners and The San Diego Community College District we are contacting you to initiate a process we hope will lead (to) the purchase of your property at 1027 15th St. in San Diego, California. … TMG Partners has been designated as the development partner for the District…. The offer was for $750,000, under their initial asking price. But the letter also mentioned tax advantages that the owners would be eligible for by selling land for a public use. Martin, the broker for Madigan and Nieto, later said he had called the District’s point-person before mailing the letter, Damon Schamu, for permission to use TMG’s name in association with the District. Martin claimed that Schamu gave him permission. Schamu denied dealing with Martin or even recognizing his name. After the U-T had begun their investigation in 2007, Schamu said he had learned of Martin’s letter from another property owner on 15th Street and had never actually seen it. But he had been concerned because the District’s name was in it. “I called Mike Madigan and Paul Nieto,” Schamu told the U-T, “and told them they had to cease and desist and not to make that representation.” Schamu said he did not consider intervening in the pending sale of the 15th Street property or approaching the sellers to have them pull out of escrow. “It wasn’t our job to do that,” he said. “My focus was on representing the district and being respectful to the owners of the property.” In the meantime, Schamu was still involved in negotiations with Madigan and Nieto on the other redevelopment project in East Village. January 2005 – The Creeks and the Sumidas accept Madigan and Nieto’s offer to buy their duplex for $750,000, definitely an under market price. Yet, they had visions of tax benefits coming their way. Thus, begins a nightmarish year-long escrow for them. 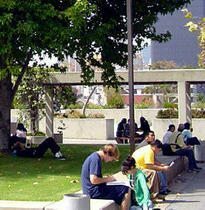 April 2005 – The Masterplan of the San Diego Community College District’s downtown expansion is approved during a public hearing. It shows the District’s plans for East Village, including presumably the property on 15th Street. The Masterplan does not become available, however, on the District’s website until over a year later, in August of 2006. August 2005 – Madigan and Nieto end their year-long negotiations with the District over developing the 2 block expansion plans in East Village. No agreement is made. Meanwhile, they’re in escrow with the owners of the 15th Street property. December 2005 – The 15th Street duplex is re-appraised for $1.125 million. December 2005 – The duplex owners have been nervous about the inaction on the sale. They had been anticipating a letter stating their eligibility for IRS section 1033 tax benefits, which they hadn’t received. Madigan and Nieto had changed the TMG name with their own names, and the closing date had been moved several times. “We knew something was wrong,” Jean Creek would later tell the U-T.
“We felt we were forced to go through with it, even though by then we knew (a neighbor) was getting a million dollars for his property” from the District, Jean Creek said. The whole deal left the couples embittered. “You expect honesty, especially when it’s bond money because it’s public money,” Glenda Sumida would tell the U-T later. January 2006 – The sale of the duplex finally closes for $750,000. Madigan and Nieto immediately transfer title of the property to a private trust under the name of Nieto’s father-in-law, James Shillady. January 18, 2006 – The District offers to purchase the property from Madigan and Nieto. District administrator Damon Schamu, vice-chancellor of facilities management, offered the appraisal price of $1.125 million, but is turned down by the developers. This offer was, however, at first denied by Schamu to U-T investigators, but who later admited that he had indeed made the offer to Madigan and Nieto. September 2006 – The private trust under Shillady’s name sells the parcel to the Community College District for $1.28 million, netting Madigan and Nieto over $500,000. The District uses public monies to make the purchase, monies from a 2002 taxpayer bond issue for land acquisition and capital projects, Proposition S, that had authorized $685 million in bonds. November 2006 – Proposition N was approved by voters, authorizing $870 million in bond funds to the District for their campus expansion plans. The District had asked taxpayers for more money asserting that the first bond – the 2002 one – the one that had $1.28 million used to buy the 15th Street land – was inadequate to complete all the projects that voters were promised back then in 2002. Spring 2007 – the Union-Tribune begins its investigation into the real estate deal. June 29, 2007 – Schamu tells U-T investigators that he had offered to buy the parcel from Madigan and Nieto in January 2006, right after their purchase from the original owners. July 1, 2007 – Union-Tribune publishes first in a two-part series on the land deal, raising publicly for the first time that developers Madigan and Nieto profited over $500,000 in their flip of the parcel to the District 9 months after they had bought it. July 5, 2007 – An editorial in the Union-Tribune is published about the deal. It asks, “What’s that smell?” in its title. July 13, 2007 – second article in series in U-T is published, and describes how Madigan and Nieto had not been authorized by the college district to buy land for it. Plus, the aritcle pointed blame at Damon Schamu. Very soon after this, Schamu abruptly resigned his 27 year job with the District. He had been responsible for overseeing $1.56 billion from the two bond measures. He had been giving U-T reporters different stories. July 15, 2007 – A second U-T editorial, entitled “Sweet or shady?” calls for an investigation of the Madigan and Nieto District deal. “These transactions warrant a thorough investigation leading to a full explanation by an independent office expert in detecting illegality, corruption or impropriety. The district attorney’s Public Integrity Unit fits the bill,” it concludes. July 22, 2007 – columnist Gerry Braun calls for Madigan’s ‘retirement’ and for Nieto to resign from the Regional Airport Authority board. December 13, 2008 – Union-Tribune announces DA has decided not to prosecute anyone. The U-T article quotes college district Chancellor Constance Carroll as being estactic. “The outcome is wonderful. It’s an exoneration,” she said. When the scandal first broke, everyone was shocked, of course. There were the strident U-T editorials. The Chancellor of the District, Constance Carroll exclaimed that she was “shocked” that Madigan and Nieto had bought the property while claiming to represent her District. “The board had no knowledge of this. I had no knowledge of this,” Carrol told the U-T in July 2007. A District spokesman promised an immediate investigation. Then City Attorney Mike Aguirre brought up a civil suit against the developers, but put it on hold for the criminal investigation, begun by his office. Then, of course, there was the investigation by the DA’s office that was begun. This brings us full circle. What ever happened to the District’s investigation? Now that Mike Aguirre is gone, what’s the status of his civil suit? When the Union-Tribune first published their series on the land deal, they quoted Robert C. Fellmeth, director of the Center for Public Interest Law at University of San Diego School of Law, as saying he saw problems with the real estate transaction. “The college should have acted in a timely fashion to acquire the land before it became publicly known that they wanted it.” And importantly, Madigan and Nieto had a “very strong fiduciary duty” to the college due to their exclusive negotiations, and it would have been unethical of them to use any knowledge from that relationship to make profit at the District’s expense. “If Madigan and Nieto learned of the college’s intent to buy this property through their fiduciary role in the redevelopment project, they have a problem,” Fellmeth said. So, will the scandal be buried afterall? A scandal unearthed by enterprising reporters of the media monopoly only to be shoveled into the circular file a year and half later by the very same newspaper after the DA has found no criminal culpability? A scandal only worth a half million. A scandal that pales in comparison to the current national scandals of governors selling senate seats. Yet, it is worth noting that the history of this city is filled with such scandals, where local developers make it big with public land or via public entities that hand over public monies. When law enforcement agencies who are expected to enforce pubic standards of integrity and transparency in public dealings, exonerate the scandalous conduct of local bigwigs, it sends a message that, yes, indeed, the ol’ boy network is still alive in San Diego. The power structure that has ruled for decades is still intact. And besides, no one’s paying attention. Originally posted December 18, 2008, by Frank Gormlie. I invite anyone who wants to correct or improve upon the record posted above to do so through this comment section, or if you’d like to write something longer, that too. Let us know if you have a tidbit about this land deal and scandal. Help all of us to understand why stuff like this gets buried in the sand of paradise all the time. The latest UT article was forwarded to all San Diego Community College employees, but somehow I doubt they’re going to get a link to this article. One other item: Braun left the U-T (willingly, or?) and now has a plum job working for Jerry Sanders, doing? Whatever, taxpayers are now paying Braun to work for Sanders. Sweet.